We’ve listened to countless home inspectors identifying issues of concern. We’ve come to understand what needs to be done on a seasonal basis to keep a home in tip top shape. We’ve counseled sellers who are preparing their homes for sale and have to address what years of deferred maintenance has done to their property, often at great expense. By following our simple seasonal protocol, you will be able to address small problems before they become large, expensive ones–saving you money in the long term and protecting your home as an investment. We have broken out our recommended list of Fall Home Maintenance projects into Exterior and Interior tasks as well as Essential Jobs and Secondary Jobs. The essential jobs are the ones that must be done and the secondary jobs are the ones that are just a bit lower on the priority ladder. Roof: Inspect roof surface, flashing, eaves, and soffits. Repair if needed before winter weather hits. The life of a roof depends on local weather conditions, building and design, material and material quality, and adequate maintenance. This can range from 20 to more than 150 years. Gutters and Downspouts: Clean out once the leaves are down. Check for proper slope. Make sure downspouts drain water away from the foundation. Make sure the underground drainage system is functioning. Clogged gutters can damage your roof and siding and cause water to seep into the foundation. With proper maintenance, these systems can last for 20 – 40+ years. Outdoor Faucets and Sprinkler System: Shut off valves to outdoor faucets. Open spigots and drain, and store hoses. If water freezes inside your pipes, it will cause them to expand and possibly crack – which could lead to serious problems. And don’t forget to winterize your sprinkler system. Sprinkler heads typically last 10 – 14 years, so check for any that may not be functioning properly. Yard: Rake leaves and aerate the lawn. Take care of any insect or vermin problems you may have. See if any trees or shrubs need to be trimmed. Take down limbs that are dead or dying to prevent them from falling during winter storms. Clean and store your outdoor furniture in a dry place. Empty ceramic pots and store in your garage or basement so they don’t crack. Winter Necessities: Have sidewalk salt, good shovels, etc. ready for winter. Be prepared for that first snow! Order your seasoned firewood and store it outside, covered with a tarp. Update your emergency supply kit with flashlights, fresh batteries, a first-aid kit, food, water and a portable radio. Siding: Inspect and clean siding, repair if needed. Inspect caulking and replace any that is deteriorating. You’ll stay warm and save money on your heating bills. It typically lasts 5 – 10 years. Touch-up siding and trim with paint. Exterior paint typically lasts 7 – 10 years, and depending on the type of siding, a life expectancy of 20 – 100+ years for the siding can be assumed. Storm Windows and Doors: Replace any cracked or broken glass. Tighten or repair any loose or damaged frames and repaint if needed. Replace damaged hardware. Aluminum windows are expected to last between 15 and 20 years, while wooden windows should last nearly 30 years. Tighten and lubricate door hinges and locks. Exterior fiberglass, steel and wood doors will last as long as the house, while vinyl and screen doors have a shorter life expectancy. Driveway: Mend cracks and gaps in the driveway and walkway. A well maintained asphalt driveway will last 15 – 20 years, and a concrete walkway 40 – 50 years. Apply driveway sealant every 2-3 years. Smoke and Carbon monoxide Detectors: Test batteries and replace if needed. Carbon monoxide detectors last 5 years and smoke/heat detectors last less than 10. Air Conditioning Systems: Winterize air conditioning systems. Remove and store all window units. If you have central air, cover the outside unit with a cover that allows air to flow through, and turn off the power to the unit. This should be done by a licensed air conditioning contractor. The life expectancy for a central air conditioning system is approximately 20 years. Heating System: Have your system inspected annually by a professional. Schedule an inspection in late summer/early fall before the heating season begins. If you have a system with filters, change the filter every month. Clothes Dryer: Vacuum lint from ducts and surrounding areas. Static electricity, more prevalent during cold, dry weather, can ignite lint. With proper care, your clothes dryer can be expected to last 13 years. Range Hood: Wash fan blades, housing and screen. 14 years is a realistic life expectancy for a range hood. Refrigerator: Vacuum the coils for maximum efficiency. This will also help the appliance reach its maximum life span of 13 years. 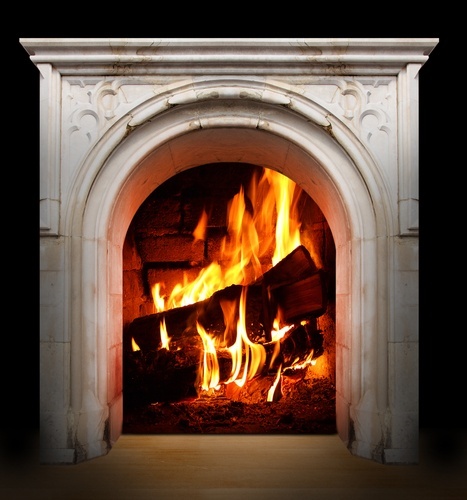 Fireplace and Chimney: Have your fireplace professionally inspected and cleaned depending on usage. Repair as needed. A gas fireplace can be expected to last 15 – 25 years. Depending on the type of chimney cap – mortar, metal or concrete – service for 15 – 100+ years can be expected with proper maintenance. Chimney flue tiles can last 40 – 120 years. Window and Door Weather Stripping: Inspect and repair or replace if it is deteriorating or if it does not seal. Seal any gaps. The gaskets/weatherstripping of exterior doors may need to be replaced every 5 to 8 years. Thermostat: Clean heat sensor and contact points. Check accuracy and replace thermostat if it is not functioning properly. Thermostats can last 35 years but they are usually replaced before they fail due to technological improvements. Interior Caulking: Inspect caulking around tubs, showers, and sinks. Replace any if it is deteriorating. Sump Pump: Test the sump pump to be sure it is working properly. Sump pumps generally have a life expectancy of 7 years. Insulation: Install new insulation or improve the existing material to help keep your home nice and toasty this winter. To help save on energy costs, focus on lining your attic with proper insulation. Cellulose, fiberglass and foam insulation materials will last a lifetime as long as they are not punctured, cut or burned and are kept dry and away from UV rays. This is true regardless of whether they were installed as loose-fill, “house wrap” or batts/rolls. By taking the time to complete these home maintenance tasks, you should have a more pleasant winter and a spring without too many unwelcome surprises.